>>a long overdue Hello Niccoco update! It has been literally four months since my last visit to this blog. Time has swirled past so quickly, I can hardly believe it is December and the New Year is right around the corner. One of my last posts I mentioned I took on a position within the admission department at Pennsylvania College of Art & Design. With that I’ve been trying to carve out my time for my own personal work. Though I’ve been keeping busy with creating and selling I’ve neglected to share exciting news here!! First I’d like to share about my interactions with AllPort Editions, a company based on the West Coast in Portland Oregon. 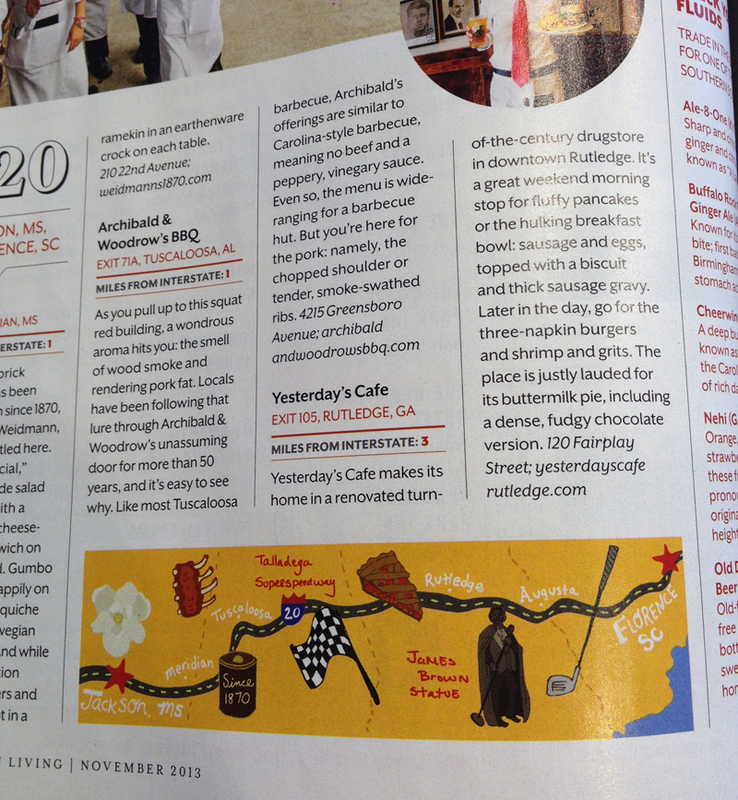 I initially reached out to them this past spring with some of my latest work, particularly the illustrated maps. They were on the hunt for pieces inspired by states and cities and I felt my style and subject matter lent perfectly with what they were seeking. After making contact, time passed by as it typically does… I must say it was a great “pinch me” moment when I heard from AllPort in August. 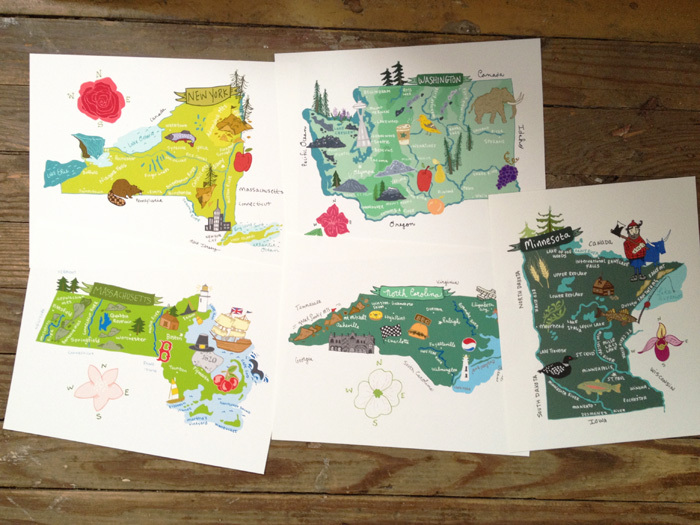 They expressed an interest in licensing a handful of my state maps for a greeting card collection. Below is a peek at some samples they sent me along with our contract. I can hardly wait until spring 2014- my cards will be in production and available for vendors to purchase! 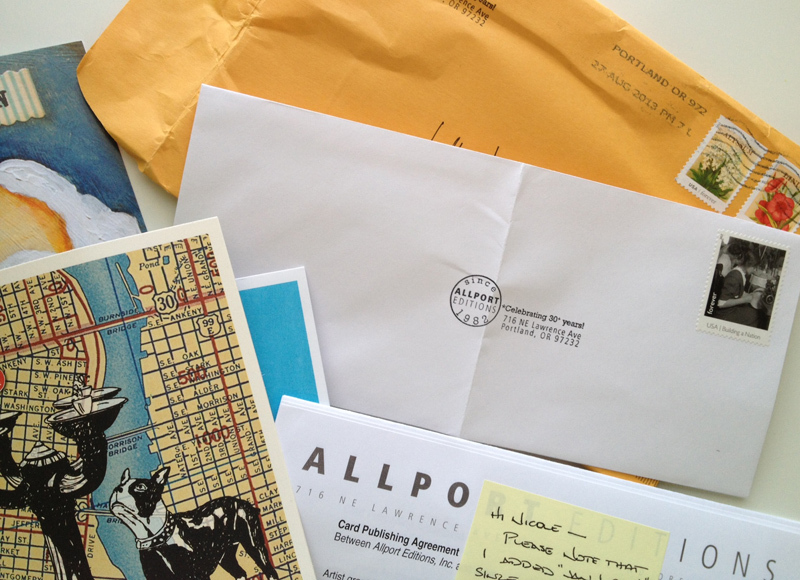 i will be receiving a handful of goodies from AllPort once available! The next bit of news is equally as exciting and I do believe I will update with another post showing a little bit of my process. 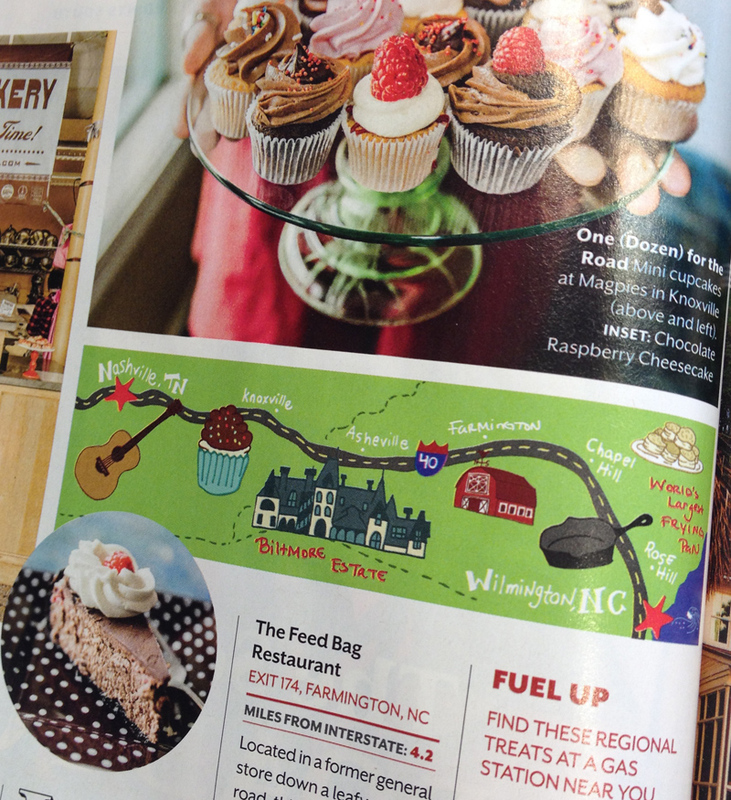 I was contracted by Southern Living magazine to create three illustrated maps for an article about the South’s most traveled roads during the holiday season! Another “pinch me” moment right there! I’ll save the details for my next post but below are the finished pieces in the magazine which came out in November issue. So stay tuned for my next update (which I promise won’t be in another 4 months)! 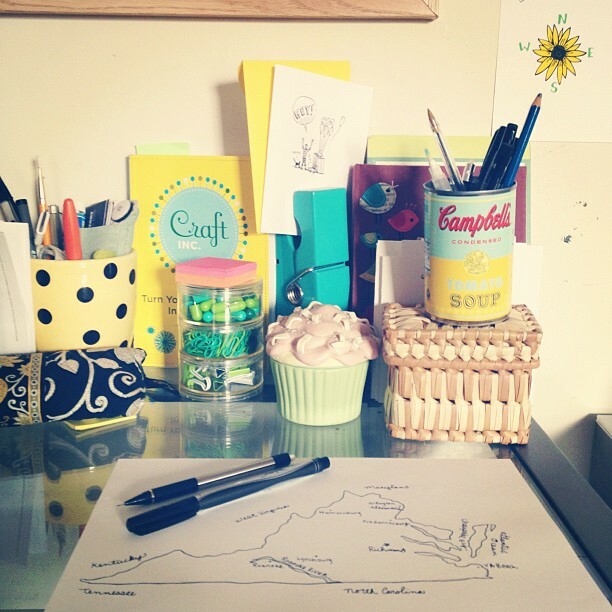 Over the weekend I reached a milestone on my illustrated map series… number 25, the halfway point!! I can hardly believe it! It feels great knowing that as I continue with the next state, I’ll be more than halfway done. 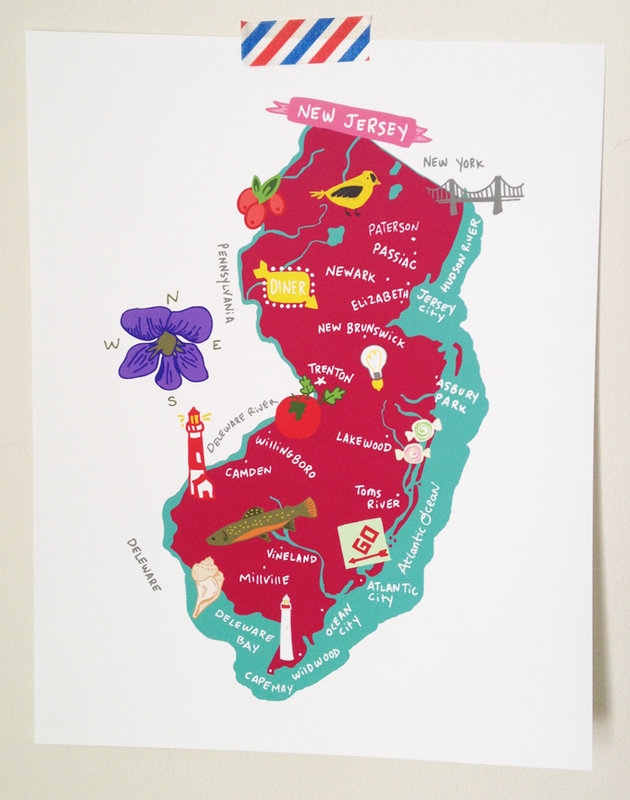 The lucky state is… New Jersey!! 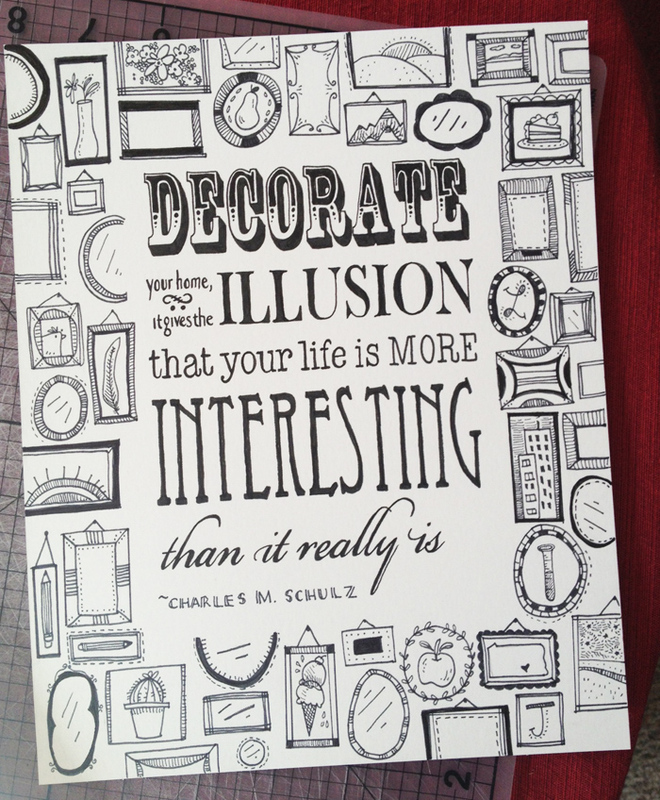 This print and the 24 others can be found in the hello niccoco etsy shop! In between the project of designing all 50 states (I’m currently on number 21 now- Colorado!!) I have had this need to create something else, something completely inspirational. Adventure is brewing deep inside me and I can hardly wait for warmer temperatures, sunny days turned into sunny evenings… so, I turned to some favorite naturalist quotes and decided to illustrate them! 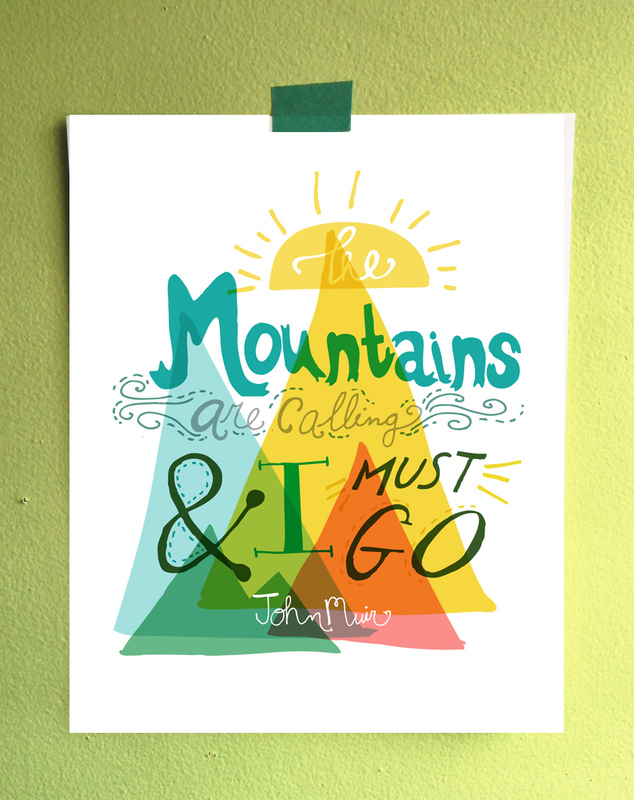 The first that sparked my desire is John Muir’s quote “The mountains are calling and I must go”. It might be my favorite of the newest designs because it was the first or because its overlapping with bright bold colors or… the connection to the words, to be surrounded by something larger than life. 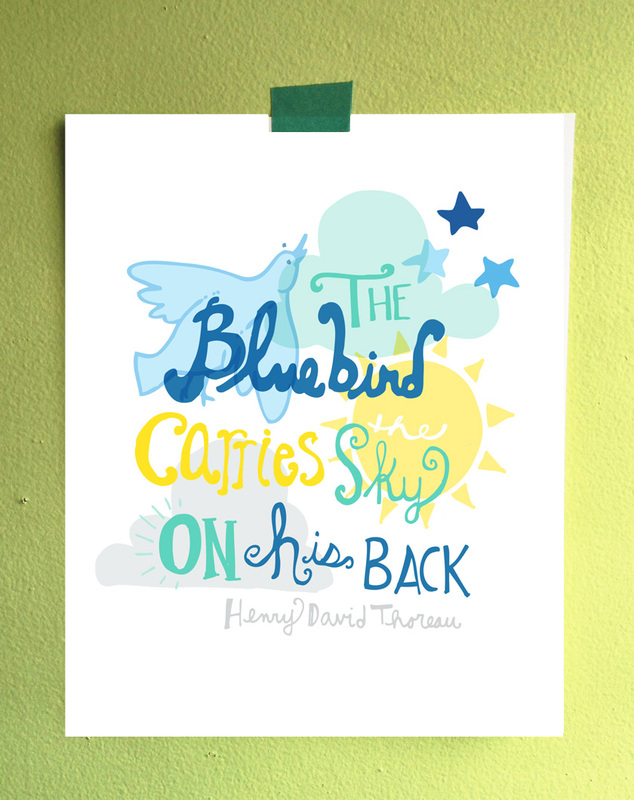 “The bluebird carries the sky on his back”… I found this quote to be so sweet. For the longest time I thought if I could be any creature in the world for just one day, I would choose a bird. The sights they must see… just priceless. The third quote is absolutely a popular one, with good reason! 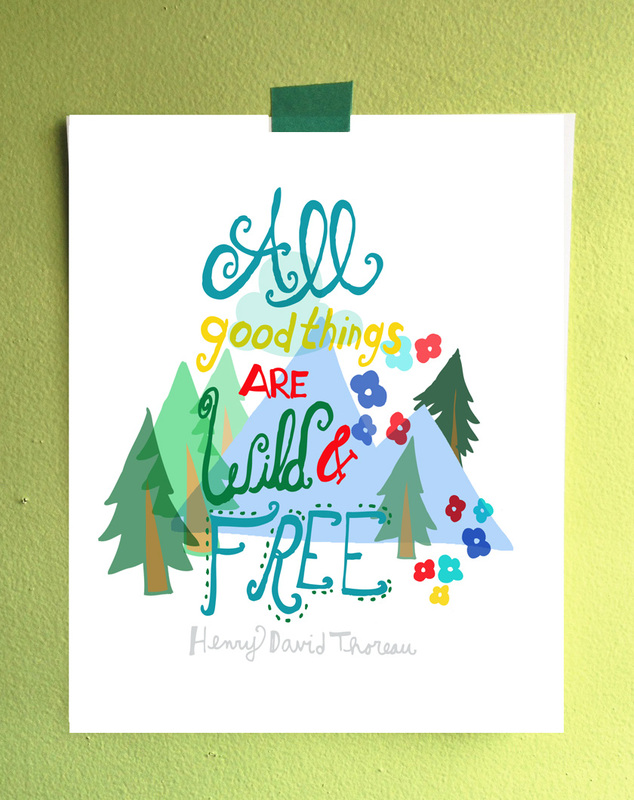 “All good things are wild and free”, so simple and oh so true. Each of these nature filled designs are listed as 8×10 prints in the hello niccoco Etsy shop! I hope you enjoy them as much as I do and feel inspired to make your own adventure! Time has passed quickly since my last post, but I promise art has been created in these past few months! 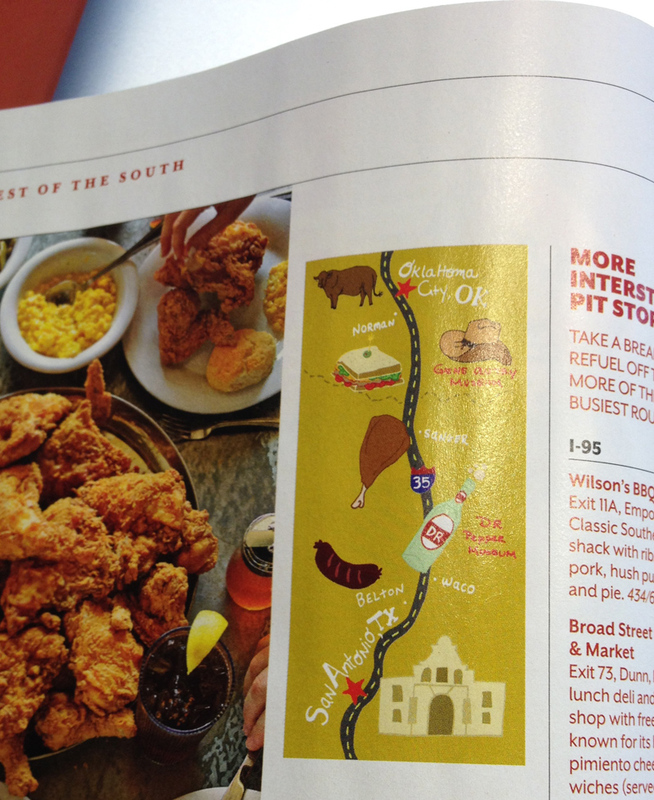 My latest obsession has been state maps! I set a goal for myself last fall to do one a week and within a years time I’d have a wonderful collection and all the states complete! I’m well on my way to reaching the half way point (currently finished 18 onto number 19!!!) and as I make my journey around the country, I have gotten a lot of positive energy from these designs which has helped fuel my project! It’s really a personal goal to do these, its just something about the process… researching (something about American history fascinates me), the learning, the drawing, and putting it all together to make a pleasing piece of design. It’s truly fun! I decided to go ahead and organize the prints I had on hand by color and snap some shots to share the collection thus far with you. The states that I have completed but are not shown include Texas, Iowa, Tennessee and Missouri… but don’t fear!! All can be found in my etsy shop! As promised, here is part 2 of the Matt and Nicole wedding gift collaboration!! We chose to create the piece on a nice sheet of bristol paper- it was more fitting for the couple and the quote we decided on. Can I just say how much I love the irony in the gift/quote. The bride and groom literally have been together forever, and have such a sense of humor that we knew this was perfect (I kind of want to make a print for ourselves, is that bad?!). Like the previous collaboration, Matt designed the type layout and I created the decorative border of frames. As I was inking inside the frames, I was inspired by our very own home decor and included things we have on our walls- like maps and our initials… can you tell we had such a blast designing these gifts? Really can’t wait until we work together again- maybe this time it’ll be for us to keep!! 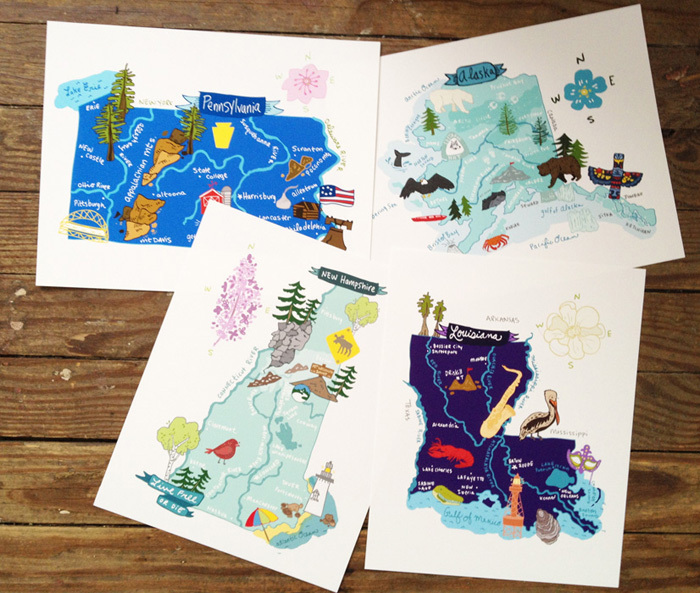 I must admit, I’ve been wanting to first illustrate all the states that are near and dear to my heart… you know, all those ones with favorite vacation memories and the ones on the top of the must travel to list. But, there’s something thrilling about learning all about those other states. The ones where I really only know their location, capitol, and abbreviation- embarrassing but true! 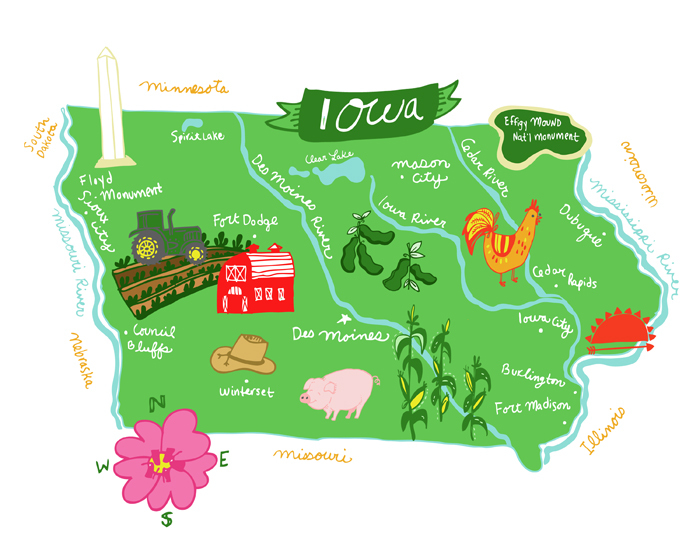 So I chose Iowa, partially because I’m connected to the state (selling prints at the fabulous shop Domestica which is located in Des Moines), and because I knew very little about it! See the cowboy hat, thats where John Wayne was born, an amazing fact I did not know! For me this whole process isn’t just about creating, but learning as I move forward in this self driven project. I truly hope you are enjoying it as much as I am. I can hardly contain my excitement for what I’m about to share! The past 2 weekends Matt and I have attended weddings, and decided for each of them to give a more personal gift. We combined our super talents of being creative and worked together for the first time EVER on a finished piece of art. In our 5+ years of being together, this is truly the first collaboration of Matt and Nicole. Its amazing that you can see both of us and our styles melding together. Ok, on with the snapshot! Matt discovered the quote and found it quite fitting for the future husband and wife. And yes, that is a slab of wood! How perfect for the quote (which in case you haven’t figured it out, Matt designed) and the surrounding imagery done by myself! 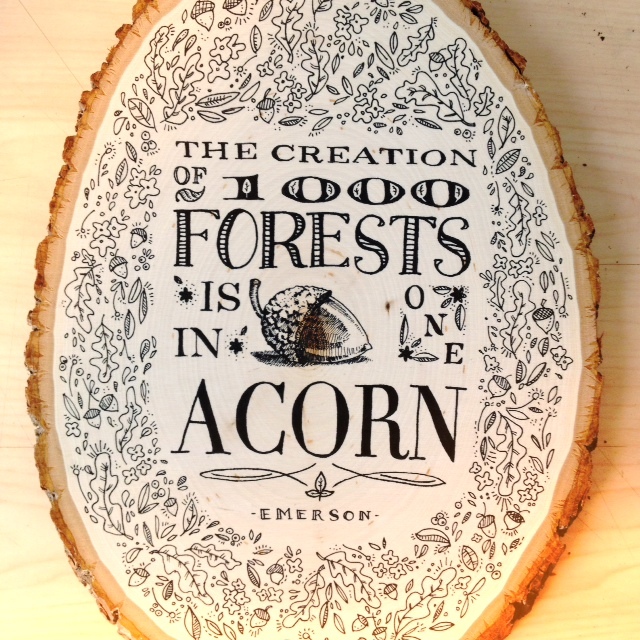 We were able to draw right on the wood, with no ink bleed or smearing. We fell so in love with how it turned out, we almost didn’t want to give it away!! However… we are completely thrilled that the happy couple gets to enjoy/hang it in their new home together. And here’s a peek at the gift wrapped up in the most lovely Rifle Co paper that I got from Mommalicious!! Did you notice this is wedding collab part 1? Collab part 2 will be shared next week, so stay tuned!! 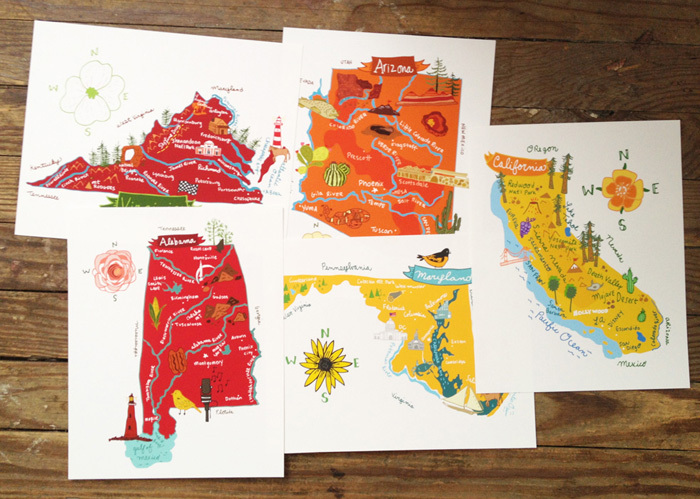 The state we visit most frequently (Baltimore is only an hour-ish away + all of Matt’s immediate family live there), the state we travel through the most (recent trips have been leading us southward) of course it had to be the next in my illustrated state series… Maryland!! 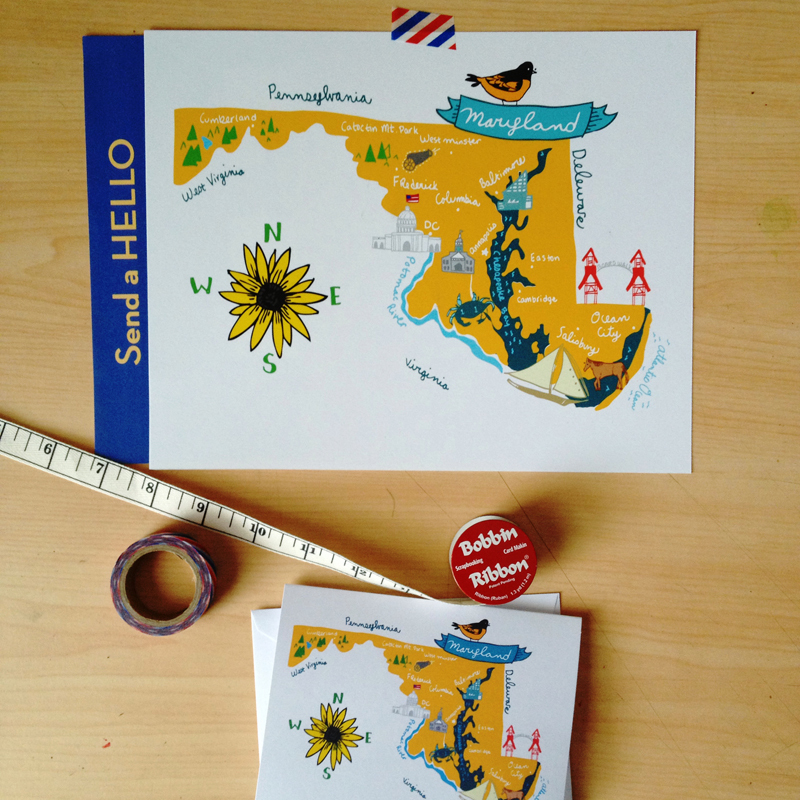 Shown here in 10×8 print form and a smaller but sweet card-perfect for sending a hello! I’m thinking of re-shooting my product to update my etsy shop photos, would it be wise to include the state prints/cards? Would you want one of your state? I’m already anxious to share the next state I have in the works. Right now its only inked on paper, but I’m dreaming of all the colors I plan to use! Ever since I dreamed up my Pennsylvania & Lancaster County illustrated maps, I’ve been itching to do more, so why not?! 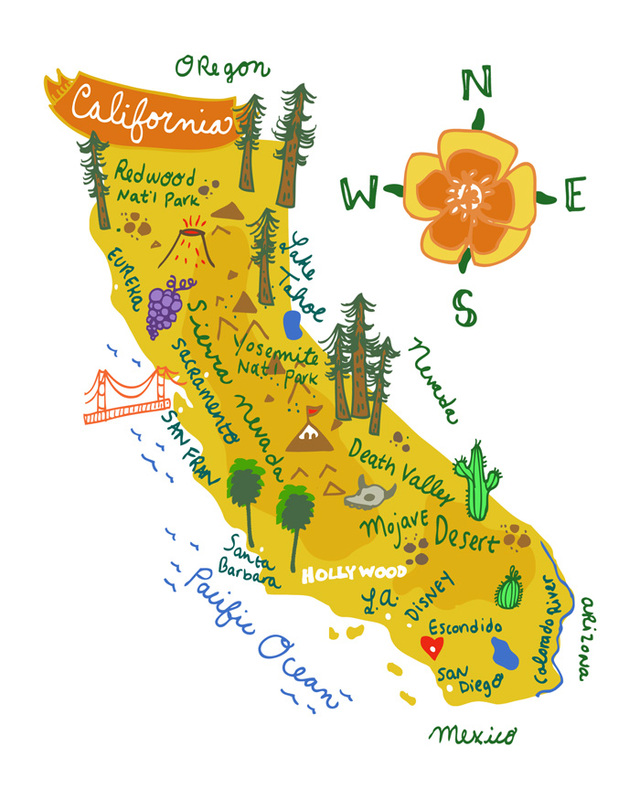 I had the perfect excuse to doodle up the golden state… a dear friend of mine bought a house in Escondido (!!!!) 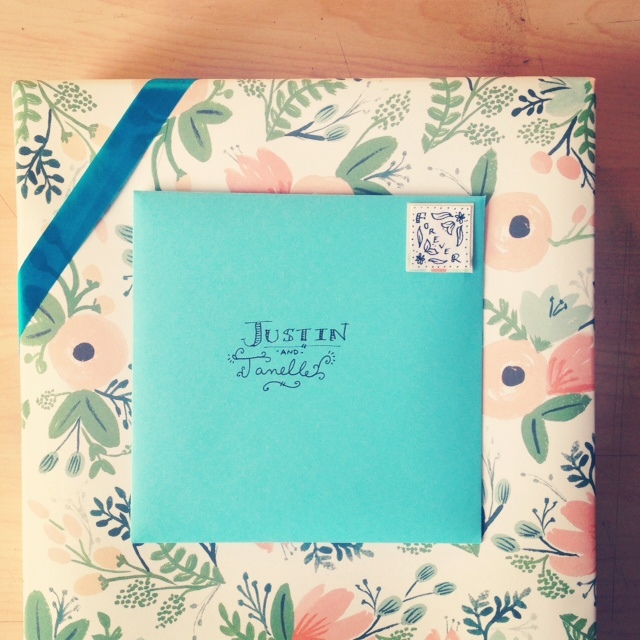 and I thought this would make the sweetest housewarming gift to send 3,000 miles away. I’ve been dying to share this- you may have even seen peeks on instagram, but I didn’t want to spoil the surprise! Since the print has arrived safely in California, here is the completed design in it’s sunshiny glory. It makes me so happy I even have one hanging in the studio! I already have the next state I want to complete in progress… how fun would it be to have a collection of all the states illustrated?! Stay tuned for the next one! Have you seen this card design? I debuted it in the spring and it’s my absolute favorite! Everything just flowed so perfectly and it came out exactly as I imagined it would. I’m the primary colors number one fan, I love things to be bright and cheerful! 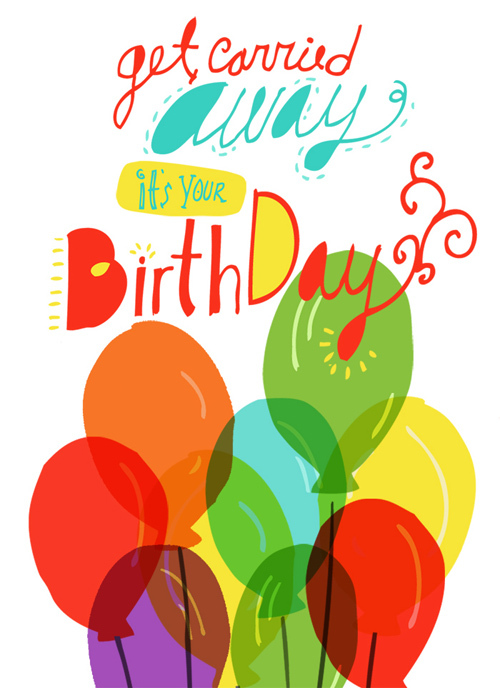 The reason for this birthday card design post is that tomorrow is my birthday! And today I am celebrating it! Lots of fun things are in store and I can hardly wait. Even though it may not be your birthday… hope you have a happy day! !